Today I did something a little different, instead of going to the local park to run 5km at Parkrun I set off to the New Forest to take part in a little event that Helen Bowyer had put together. The plan was to run 15km across the New Forest broken up in to 3 5km between pubs in a race against Helen on her horse Muttley. There where 7 runners from the ETS team, Me, James, Luke, Graham, Joe, Dominic and Peter also Rob on his road bike. The runners and the Helen would be taking the same route with the runners getting a 10min head start on each leg. Rob had a route that was about twice as long and set off at the same time as Helen. From The Rock at Canada Common to The Lamb at Nomansland. We set off across Canada Common from the back gate of The Rock, reasonably early on myself, James and Luke hit the front. Luckily Luke had run the route for this leg before so we didn’t have to do any looking at the map and managed to make our way to the Dealze Wood easily enough. We could probably have cut the corner a bit at the end and shaved some more time off. We had about a 5 min lead on Rob and another 3 over Helen (though she did have to detour a little to point Peter in the right direction). From The Lamb to The Royal Oak at Fritham. This was the shortest leg, but after a short climb through Bramshaw Wood it was across the open plain. The good view meant that Helen could see us and helped by the soft ground meant Muttley could go faster and caught us up with about 800m to go. Rob arrived pretty much at the same time as well. From The Royal Oak to The High Corner Inn. Jame, Luke and me hit the front again setting off, but the fact I’ve not been doing much more than 5ks recently really started to bite. I managed to stick with them both for the first half until we crossed the stream then we started to spread out. The spread ended up big enough that I lost site of Luke and James was long gone. I had a small nav failure at the bottom of the last climb up to the High Corner Inn, I think it was just my subconscious not wanting to climb, as I went past by about 400m and had to turn round and come back. Rob was first back this time. After we’ve finished we all went back to The Royal Oak for some lunch. It was a really good day out and I’m really up for having another go next year and maybe even have a look at the full marathon version at some point. A project at work recently came up to do with using one of the Emotiv headsets to help out a former Italian IBMer who was suffering from locked in syndrome. The project was being led by Kevin Brown who was looking for ways to use the headset to drive things sending email and browsing the web but he was also looking for a way to interact with some other tech around the house. The TV was the first on the list. 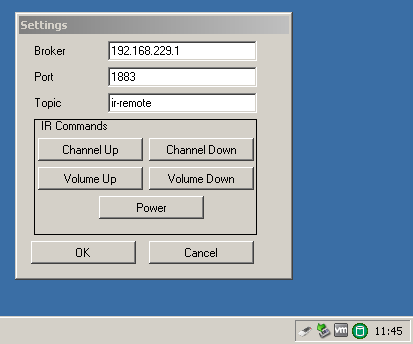 Continuing on from my previous work with controlling TVs and video walls with MQTT I said I would have a crack at this. My earlier solution was limited to LG TVs with serial ports and this needed to work with any make so a different approach was needed. It also needed to run on Windows so it was also a chance to play with C# and .Net. To be TV agnostic it was decided to use a USB IR remote from a company called RedRat. They make a number of solutions, but their RedRat III was perfect for what was needed. The RedRat API comes with bindings for C++, .Net on Windows (and a LIRC plugin for Linux). The RedRat III is not just a IR transmitter, it is also a receiver which means it can “learn” from existing remote controls so it can be used with any TV. Kevin is using Emotiv headset to drive Dasher as the input device. Dasher is a sort of keyboard replacement that allows the user to build up words using at a minimum a single input e.g. a single push button. As well as building words other actions can be added to the selector, Kevin added actions for browsing and also to control the TV. These actions publish MQTT messages to a topic with payloads like “volUp”, “chanDown” or “power”. So now we had the inputs it was time to get round to writing the code to turn those messages into IR signals. There are 2 MQTT .NET libraries listed on the MQTT.org software page. I grabbed the first off the list MqttDotNet and got things working pretty quickly. The following few lines sets up a connection and subscribes to a topic. And that is pretty much the meat of the whole application, the rest was just some code to initialise the RedRat and to turn it into a System Tray application with a window for entering the broker details and training the commands. Unfortunately just a few days before we were due to have delivered this project we learned that the intended recipient had picked up a respiratory infection and had passed away. I would like to extend my thoughts to their family and I hope we can find somebody who may find this work useful in the future.